We got to Tokyo a little past 11am and got our tickets from our friend Ate B. Then we had lunch at the nearby Tenya. Ronjie & I ordered the same tendon (short for tenpura-donburi) and miso soup set. Yum. I loved my lunch. Returned to the Japan Education Center a bit after 12, in time to register. Our seats were in Row 21. 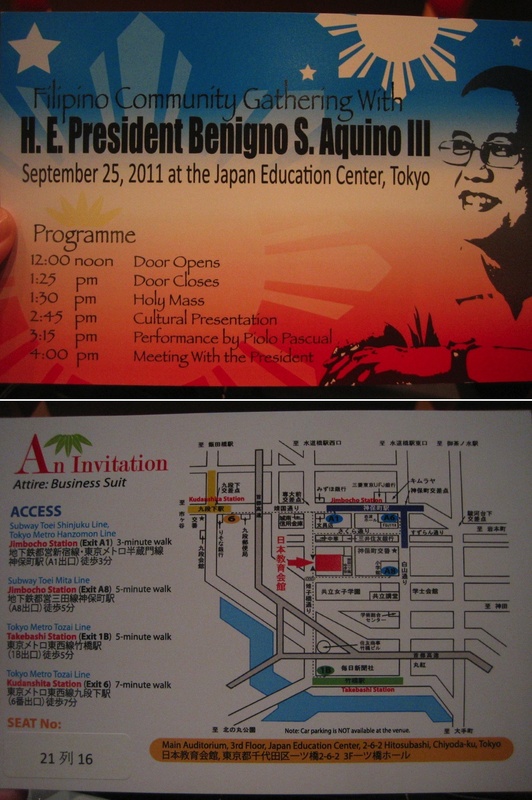 The President didn't join us for the mass (his plane most likely had not landed in Japan yet at that time). After mass, we were entertained with song and dance sets by some Japan-based Filipinos and some members of the Japanese-Filipino Children (JFC) group. Then Piolo Pascual came and serenaded the shrieking crowd with a couple of his hit songs. The whole auditorium was so happy to see President Noynoy when he finally got onstage. 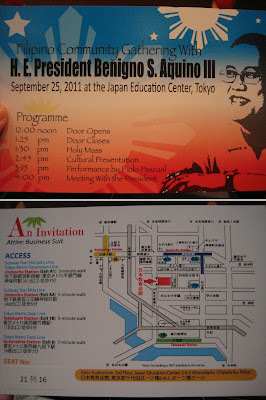 :) PNoy gave a speech, reporting to "his boss"--us, the Filipino people, and charmed the crowd. Ambassador Manuel Lopez also gave a speech, we watched some slideshows, and some tokens were presented. The gathering ended with a photo session with the President. Since we were a total of 800 who all wanted a photo with the President, the organizers "divided" the whole group into 9 smaller groups, based on our seats, and set an orderly flow for the group photo session onstage. That's around 100 people per group shot. Personal cameras weren't allowed; the official photographers were in charge of taking the group shots (a compilation of all their photos was going to be made available to us in a few days). At para hindi na tumagal pa, bawal din makipagkamayan sa pangulo. Well, we decided to video our photo session instead. Check it out! :) It's 3 minutes long; fast-forward to the last 45 seconds to save time.